The views are breathtaking at this spectacular home situated on approx. 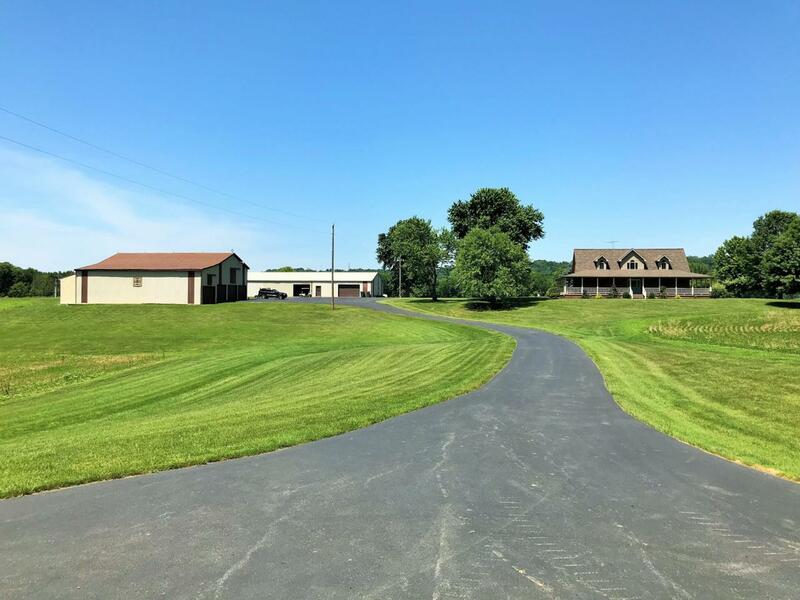 40 acres surrounded by beautiful wooded Ky hillsides, open crop land and the mighty Ohio River. Enjoy the serenity and beauty of your surroundings from the more than 1500 sqft. of wrap around porches w/ exposed aggregate stone floors. This wonderful brick home boasts a two story front foyer, a stunning great room with log accent wall and cozy wood stove, a spectacular kitchen with lots of lovely wood cabinets, granite countertops, SS steel built-in appliances, center island w/ cooktop and a spacious pantry. This home also has six (yes six) bedrooms & 3 full baths including a spacious master suite w/ walkout to the covered porch. This property also offers a 36' X 100' building which has another parking garage, a hugework shop complete with a vehicle lift, its own half bath and kitchen/sitting area great for taking a break during a hard days work in the shop. There is a 38' X 66' metal barn providing tons of additional storage space with an attached shed great for parking farm equipment. You will also find your own park like setting down by the river complete with your own picnic shelter, dock & boat ramp. This is sure to be a favorite spot of family & friends. This is a one of a kind property!! Don't miss this opportunity!! Call today for your private showing! !